Letty and Ray Owings, ages 89 and 91 recall Halloween and also describe some of the superstitions and customs of years past. Halloween was a legitimate holiday and a big day for us in the country. Kids planned and planned, months in advance, and you would have been considered out of it, if you didn’t participate. Farm kids had to do something to lighten the load, and Halloween was an opportunity to be someone else. Everybody got dressed up, usually in an old shirt from a trunk of old clothes, and everyone got a mask. Witches were popular, and masks cost a nickel, unless you were rich, and could spend a dime. We got our masks at Wolfcammer’s, the general store and meeting place in town. Freda, who ran the store, knew everything. Without radio, if you wanted to know anything, you went to the store- that’s what you went there for- that, and a few other things. Men most often shopped at the general store, and someone might say, “Oh, he’s been to town,” or “Oh, you’ve been to town. What’d you find out?” It was Freda who first informed me that my grandmother had died. Freda sold masks for a nickel, as well as salt pork, molasses, pickles in a barrel, dried and smoked meats, and other necessities like flour and sugar. Lord help us, there was a lot of crap happened, and it’s a wonder nobody was killed, looking back. Pranks were more popular than any trick-or-treating, and there was all manner of soaping windows, or jumping onto porches, knocking on doors or ringing doorbells and running away. In an effort to see whoever could think of the most fantastic stuff, a bunch of us grade schoolers once sneaked into a farmer’s barn and climbed into a his hayloft, accompanied by the grade school teacher, who hadn’t gotten over the Halloween fits even as an adult. When the farmer came out with his shotgun, the kids took off and left the teacher in the hayloft, where he got caught up there somehow. They said later that he jumped out and walked somewhere, into the night. Parents and teachers were very cooperative. Grade school kids dressed up to go to school, and the teachers were generous about letting us get away with doing next to nothing on Halloween. We also loaded hay into a wagon, hooked up the horses, and everybody got on the wagon and rode. Hay rides were popular, but not necessarily connected to Halloween. -If you laughed very much in your home, sadness would replace it. -Thirteen was an unlucky number. -If a black cat ran across the road, or black cats in general around Halloween carried a connotation of ‘bad luck,’ but no one took it seriously. -Wishbones could bring good luck (your wish would come true) if you got the longer part of the wishbone, when you pulled it apart. -Stepping on a crack was bad luck. -The windows were opened as someone was dying, even in the middle of winter. -If you committed suicide, you could not be buried facing East, because that is the direction of the rising sun. One man who did commit suicide was buried backwards, to face the setting sun, because suicide was considered to be a form of murder. -Pregnant women did not attend funerals. -The eyes of a dead person were closed, never left open. -When you butchered a pig, you gave the best part, usually the heart, to someone else as a gift. Not to do so was considered selfish. During Halloween in particular, the elders told stories, the more exaggerated the better. They were not so much scary stories as they were tall tales of their own Halloween adventures, embellished to make it sound like they had way more fun than we were having. Please note: If you like what we do, please consider making a donation so that we can continue! 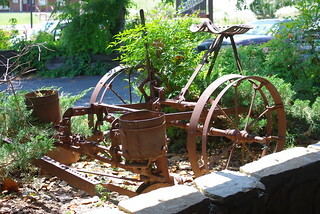 old horse drawn corn planter by Colbyt69, creative commons, flickr. This is a true story from the Great Depression as told by Letty Owings, age 89. 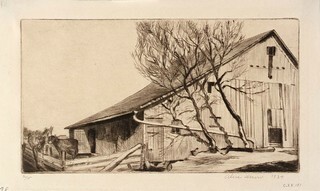 It is a true account of various farming tasks during the historic drought years of the mid-1930s. In the spring of each year, the community farmers watched the sky and talked with each other in church about when to prepare the fields for planting. For corn, the fields had to be plowed and harrowed, and then the rows were set. The implements used to plow, break up and smooth the soil and form rows were horse-drawn. After the fields were prepared for planting, corn planters were also hitched to horses. A container on the corn planter was set to click open every three feet or so, and release three kernels of corn to the soil. So far, we are talking about mechanization. This is a true account of life on a small Missouri farm during the Great Depression, as told by Letty Owings, age 89. It is a description of two precise arts. Other examples of precise arts include quilting, weaving, and canning. Two labor-intensive jobs that the adults did every Fall was to prepare the lye soap and the apple butter. Each family prepared its own supply of these two staples, and the supply had to last the whole year. Equipment was essential for these jobs. For the apple butter, the large iron kettle had to be copper lined so that the apple butter did not stick or burn. For the soap, a large iron kettle was used. The apple butter kettle was passed down through the generations. If a family did not have an apple butter kettle, they shared with another family. Newly married couples inherited a kettle and when a farmer died and the farm was to be dissolved, there was always much discussion about who was going to get the apple butter kettle. 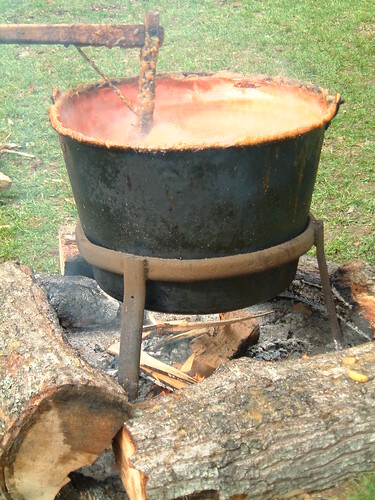 The apple butter was cooked over a fire with a long-burning wood, and so that the person stirring could withstand the heat, she used a stirrer that was very long- five feet or so. Kids never did the stirring or the stoking of the fire, for fear of scalding or burns. My mother did the stirring, and there was a very specific rhythm to it: right side-left side- middle. The rhythm prevented any sticking and ensured consistency and taste. One part was never stirred more than the other. Each woman had her own recipe of spices and sugar in specific ratios that had also been handed down through generations like the kettle. Farming women set aside three days for the apple butter. The first day was for peeling, the second day was for cooking and the third was for canning. There was always talk about whose apple butter was better and every woman believed her apple butter was the best. Apple butter was a staple and making apple butter in the fall was a matter of pride for each family. The women always wore sun bonnets to stir the apple butter because a tan was considered ugly. Women covered their arms to prevent any burns from splattering. The men built the fire and set the kettle in place, but the women peeled the apples and did the stirring. On the third day, my mother put the apple butter into jars with snap-on lids, boiled the jars and covered the lids with sealing wax. On apple butter days I would run home real fast to watch. Like apple butter, the lye soap making was both art and ritual, and it was done individually, not communally. Soap was made in a large iron kettle over an outside fire, and a long stirrer was used. Women took great pride in their soap and there was always the exchange among neighbors, “What is your soap like?” My mother saved animal fat from the butchering and this was the basis for the soap. She added lye and stirred to a precise consistency. This was important because she needed to be able to pour, cool and then slice the soap into bars. The soap had a neutral, clean smell, and the goal was to make the soap as white as possible. The browner the soap, the less respect others had for the soap and for the soap maker. There was great pride in the soap quality and in how nice the cut was, and how pretty the bars. The lye soap lasted all year, and we used it to hand wash everything. I had my own little washboard, that I got for Christmas. A great deal of expertise went into soap cooking. My mother was an artist and a designer who was an excelled at sewing and quilt making, and these talents carried over into her soap and apple butter making as well as canning. Today apple butter does not taste the same, probably because the apples have changed and because it is difficult to duplicate the unique and wonderful taste of apple butter that is made over an open fire. We ate our apple butter on cornbread. I assumed that cornbread came over from the old country in Germany where my ancestors came from, but I learned much later that cornbread was an American addition. Saponification is a process that produces soap, usually from fats and lye. In technical terms, saponification involves base (usually caustic soda NaOH) hydrolysis of triglycerides, which are esters of fatty acids, to form the sodium salt of a carboxylate. In addition to soap, such traditional saponification processes produces glycerol. “Saponifiable substances” are those that can be converted into soap. note: This is a true account of how a small Missouri farming community handled death before WWII, as told by Letty Owings, age 89. The customs and traditions pertaining to death in our community were in place prior to the Civil War and remained unchanged until after WWII. Prior to the Civil War, the land that would become our farm was multi-crop plantation territory where corn, wheat and clover grew. After the Civil War, the plantation area was divided into farms. Our farm was 160 square acres. We had no street address; we were part of a community that included a population of about 300 in the country and 600 in the nearby town. A woman I knew named Minni had lived through the period prior to the Civil War, and I would often visit her and listen to her stories. On the way to her house, I passed a slave graveyard of about twenty graves that remained on the property. Many of the graves were simple stone markers indicating a child’s burial. In those days death was common among infants and young children in general, and it was not regarded with the same concern that it is today. It wasn’t that people were mean about it, they were just more honest. In other words, deaths of infants and children were almost expected. Causes of death among slave children in particular were never noted or studied during that time, although looking back one can speculate that tuberculosis, pneumonia, and other diseases and childbirth complications common to that era for all children may have been the cause. We must bear in mind that penicillin was not available until after WWII. 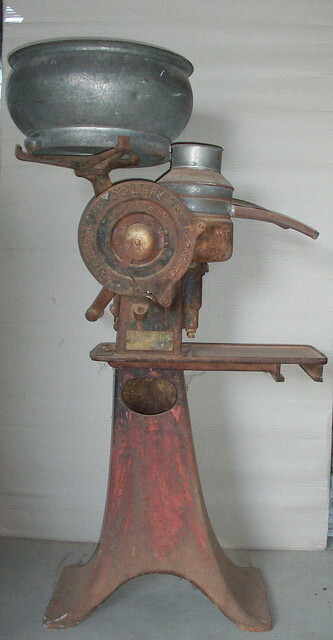 Separator by mallala museum on flickr, used under Creative Commons license. This essay is a true story about medicine, childbirth and injuries in a rural farming community in Missouri in the 1920s as told by Letty Owings, age 89. I must note up front some information on how we compose these essays. Letty’s general health is in decline such that she can no longer write much, although she is a retired English teacher and one of the better writers I have ever known. She tells me her stories on the phone and I actually fact check with additional research to add context and history of events like the flu pandemic of 1918 that killed 25 million people in the first 25 weeks. She remembers much talk of this flu from her early childhood. To my amazement, her recall is not only 100 percent accurate, but it is also substantial in terms of piecing together the history. For example, she recalls cases of encephalitis. As recently as 2007, the flu pandemic was implicated in the outbreak of encephalitis lethargica in the 1920s, which makes her recall all the more interesting. Her story coincides closely with the beginning of the keeping of vital statistics in Missouri. Record keeping began in 1911 and she was born in 1924 in what she describes over and over as an extremely rural area where there were no records kept. There was no geriatric specialty at that time, because there were no old people: life expectancy in 1911 at the beginning of record keeping was just 54 years of age. I will explain more in the essay, but before I do so I will express an opinion: there are excellent reasons for Federal agencies that keep vital statistics and epidemiological data, and efforts to do away with various Federal regulatory agencies is reckless on a good day. I strongly disagree with any political efforts to do away with health-related regulation. Our farm house had been a log cabin and the plastered and crooked wooden walls made my perfectionist mother nuts. An artist at heart, my mother was papering these walls. She saved money for the paper and cooked her own glue. She had laid boards onto the base of the cream separator for a make-shift step ladder. The boards slipped and my mother fell onto the metal prong on the base of the cream separator, and the prong tore deeply into the flesh of her hip. My father found her. in 1911 to 78.7 years in 2000. We called old Doc Martin to come out and treat my mother. By this time, the doctor had switched from horse and buggy to car. When we didn’t have Doc Martin, the patent man occasionally came around, and sometimes my dad seemed to know the right kinds of weeds to cook for homemade remedies. We used Bag Balm, a horse salve (pink salve) product that is still available today, and we used Blackberry Balsam for diarrhea. Doc Martin sewed my mother’s wound and left with his chicken that we gave him for payment. Predictably, my mother developed a fever and became dangerously sick. She was in agony and she cried and it was upsetting for me as a small child to see my mother this way. She stayed in bed, as was the custom at the time, and there was great concern for her from the community. She survived her injury, but this was not always the case with accidents. Babies were born at home until the close of WWII in our area. There was no pregnancy test, no prenatal care, and although baby bottles were first patented in 1845 and are today regulated by the FDA (for the materials in both the teat and the bottle), in those days we did not have baby bottles available to supplement feeding. So, if a baby needed milk, one had to find someone who was nursing. The infant mortality rate was extremely high and this did not change until after the war. Both economic improvement and prenatal care including early recognition and treatment of complications contributed to the dramatic improvement in these mortality rates. by Crane-Station, with note- I am trying to gather these history posts all in one place here, so forgive me if you have seen them. This is a story from the Great Depression, as told by Letty Owings, age 89. It is a true account of country school and community. In rural Missouri during the Great Depression of the 1930s, each elementary school was different. Rather than fit into any pattern, the one-house schools were community governed, and each community had a social stratification. Mine was a mining-farming community, and the farmers lorded it over the miners, even though, in some cases, the miners made more money. There was supposed to be a county school superintendent, but there was never any factual supervision because the superintendent only visited maybe once a year. Each community had its own clerk, and the school board, which consisted of a half a dozen farmers, decided who was hired in the schools. The school was supposed to be in session for eight months, but this never happened, because the kids were needed on the farm to work. Usually the school session ended in April, and kids would begin farm work at sunrise. The school had no electricity, plumbing, or central heat. There was a coal stove in the floor, and if you got too close to it, you roasted. If you got too far, you froze. There were 42-46 kids in the class at any given time, often sharing seats. The room smelled. Impetigo and bronchitis were common and chronic. Kids had sores and coughed all the time. We all shared one dipper, in a cistern. The toilet was an outhouse that was built when the school was built. We sometimes had a Sears Catalog to use in the toilet, but often not. The toilet was never cleaned, because there was no real way to get water to it. We were not grossly unhappy as school kids. We didn’t know anything else. We did not see ourselves as different compared to others. There was nothing to compare to. There was no radio, TV or newspaper. Nobody ever thought about poverty. It may seem unbelievable to us today, but back then, we never saw anything else. We were six miles from the closest paved road. It was a stratified society with the miners at the bottom. The miners were often known to drink and beat their wives, but they went to work in what were nothing more than tunnels in the ground. There were no safety regulations, just tunnels. Kids were sent in, and injuries were common. I rode with my dad, who was a farmer, on a horse, through the community, to record the names of kids who were supposed to be in school. Often, the miners took to the woods when we showed up, or claimed they did not have any children. We knew they did. Many of the homes had no flooring, and one family had buried their dead twins in the floor of the house. The level of humanity was beyond what we can imagine today. We did not think anything about it. Life and death was just all a part of life. There was no playground at the school, but sometimes the kids had a rope to play with, or, if a kid got a set of jacks for Christmas, we shared those. Tablets cost a nickel and pencils were scarce, so most kids went without. When a pencil got down to the nub, we attached a stick to it. Lunch might be a syrup bucket or an occasional boiled egg and home made bread, but certainly no butter. Kids were often hungry. The library was an old bookcase in the back, with mainly old agriculture books; the school board decided to have them instead of encyclopedias. Teachers were only required to have some kind of schooling for one year, it didn’t matter what kind of schooling, and there was no certification for teachers. When I was five, I started school, but, the teacher was mean, so I left school and returned in the second grade, which was okay because I could already read. There were four of us in school who stayed together: Norman, Betty, Pete and I. School kids were constantly in and out of school, with the miners sort of in the shadows, but the four of us stuck together. Norman and I were related. We met when we were both five; his father had gone blind. Betty’s father was a mine superintendent and an alcoholic, and Pete’s mom and dad ran a store in a clapboard shack that they lived in back of. The four of us were inseparable. The men in the community often went to the pasture to play baseball on Sundays during the Depression, and the kids would go to watch. One Sunday, one of the men hit a ball and then he threw the bat. The bat hit Pete. Pete developed meningitis, and we were never allowed to see him when he got sick. The men would ride on horses around the community to report on Pete’s condition, and we heard of the seizures that would twist his spine. Back then we called them “fits.” There was no medication. Pete died in August. He was eight years old, and his death affected the whole community. It affected me because we had played together.We had lost somebody, and it was traumatic when there were so few people that we were close to. I wanted so much to give a gift to Pete. My mother gave me a nickel to buy a gift. I went to Hicks Store and bought a lavender ribbon. My sister and I picked some day lillies, and we tied the ribbon around them, real pretty. There was no funeral and the kids were not allowed near the grave. We gave the lillies with the lavender ribbon to somebody to put on the grave, and we stood on the hillside to watch. They were the only flowers Pete had. Now there were three of us. You are currently browsing the archives for the Missiouri Histiry category.